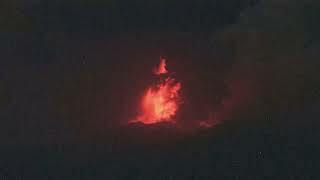 Shinmoedake volcano eruption in Japan (May 14, 2018). The eruption sent ash up to 7.6 km (25 000 feet) above sea level, making it nearly 1 km higher than April 4th eruption and the highest since a series of eruptions began on March 1, 2018. The Japan Meteorological Agency (JMA) has maintained the alert level at 3, meaning people should stay away from the mountain and remain cautious of falling large rocks within a 3-km (1.8 miles) radius of the crater.